Book a Tee TimeBuy Membership Now! The City of Carthage is calling all area golfers to enjoy our very own golf course, Carthage Golf Course. Against the wooded backdrop and along the rolling fairways of Carthage Golf Course we hope you will rediscover your passion for the game. Sharing the game of golf with friends and family happens every day at Carthage Golf Course. We have an 18-hole full-service course located in a very scenic setting. Services include a pro shop, snack bar, golf instruction, practice facility, and cart rentals. If your group is interested in a bit more excitement, speak with our staff about available dates and times for golf outings or tournaments. Don’t have time for a full round? Want to play just a few for fun, with your family, or to work on your game? We’re the only course in Missouri with Quick.golf, a pay-by-hole app that lets you play and pay by the hole at certain times of day. Click here to learn more and register. You’ll be glad you did. NEW! 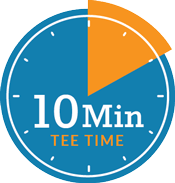 10-minute tee times every Friday, Saturday, and Sunday starting April 5. We invite our weekend golfers to enjoy a more enjoyable pace and flow of play with 10-minute tee times. It’s a better way to play, and better customer service. We’re the only course in the area with our own customized app. 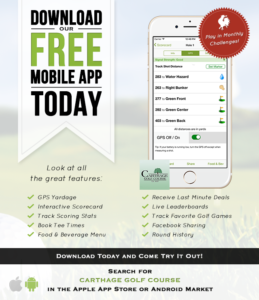 You can reserve tee times, use the accurate GPS, keep score and stats, and lots more. All on your smartphone. If you haven’t downloaded it yet, just go to your app store and search for “Carthage Golf Course.” It’s free, and it makes golf more fun.